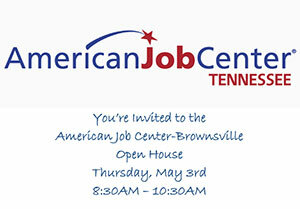 You’re Invited to the American Job Center-Brownsville Open House on Thursday, May 3rd, 8:30AM – 10:30AM. American Job Centers provide a full range of assistance to employers and job seekers in a one-stop environment. We invite you to come meet our staff, tour our center, and learn about the many services we offer to the community. This is a come and go event and is open to the public. Light refreshments will be served. Thank you to the City of Brownsville in helping to support and sponsor this event. The Tennessee Department of Labor and Workforce Development is committed to principles of equal opportunity, equal access, and affirmative action. Auxiliary aids and services are available upon request to individuals with disabilities.